Veilleux and Randell Lead the Way to an Olofsson Game Winner · Let's Go Amerks! The game on Friday night in Binghamton wasn’t off to the best start when the Rochester Americans went down 2-0 early in the second period but by the end of the night they were the better team and completed the regulation win. Victor Olofsson scored a game winning power play goal with 61 seconds remaining in the third and the Amerks won 3-2. John Quenneville scored 4:14 into the first period after the Amerks were left scrambling in their own end for the puck. Adam Wilcox attempted to play the puck behind the net but the Devils pressured to force a turnover and scored. The game was pretty sloppy at times through the first half of the first period but finally settled down when the Amerks had their first power play of the game. CJ Smith was leading the power play from the point and created multiple scoring chances. Adam Wilcox had two big saves on Quenneville with about five minutes left in the first period to keep it a one goal game. Eric Tangradi scored 20 seconds into the second period as he casually skated to the front of the net and was able to beat Wilcox glove side. The Amerks continued to control the pace of play while down 2-0 and it took an unlikely goal scorer in Yannick Veilleux to get the team on the scoreboard. Veilleux outworked Brandon Gignac along the boards, carried the puck down the right side, and sent a wrist shot past Cory Schneider on the glove side to score short handed with 5:50 left in the period. With 2:05 remaining in the second period that fourth line produced another goal. Eric Cornel and Yannick Veilleux battled for the puck forcing it free to Brendan Guhle at the point. A quick shot from Guhle was tipped in by Tyler Randell for just his second goal of the season to tie the game 2-2. A late power play for Rochester set the stage for the comeback win and Victor Olofsson scored his 15th goal of the season and fifth game winning goal. Brendan Guhle sent a quick curl pass from the blue line to Olofsson who was able to skate into the face off circle and snipe the puck into the top corner. Throughout the third period Rochester continued to control possession and the pace of play. They limited Binghamton to only 18 shots throughout the game and after a rough start limited the quality of those shots on Wilcox. A couple of mistakes early in the game set them back but that didn’t slow down the effort and it paid off. 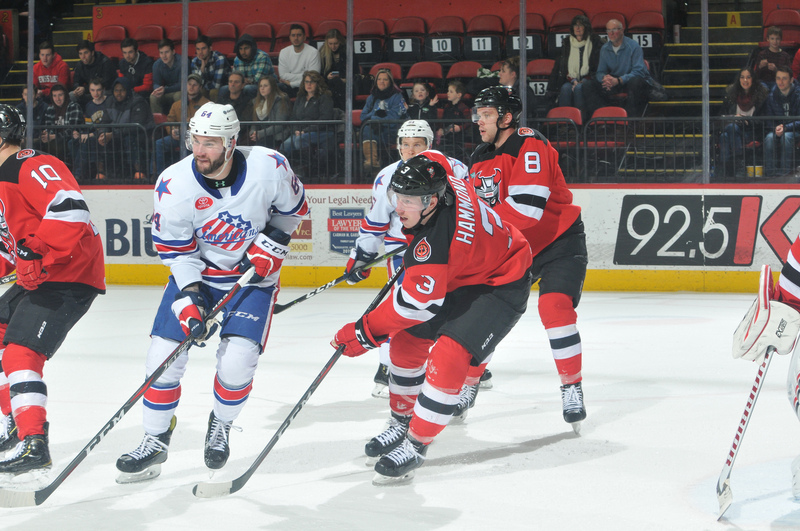 Amerks were perfect killing off four penalties and finished one for five on the power play. They also had a 34-18 advantage in shots. Taylor Leier was sick and did not play. The other scratches were Dalton Smith and Nathan Paetsch. Scott Wedgewood, Zach Redmond, Sean Malone, and Andrew Oglevie remain on the injured list.